A girl likes to wax - so why shouldn't your car? There are many pollutants which will damage your paintwork, and a good way of protecting it is by applying a protective layer to your paint. A good way of finding how protected your paintwork is, is to do a water test. 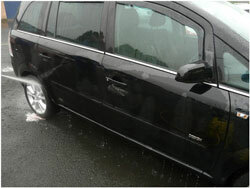 Protected paintwork should repel water, whereas water will appear to stick to less well-protected paintwork. The water sticking to the car on the right in patches shows that the paint surface is damaged, as the water is able to cling to it. 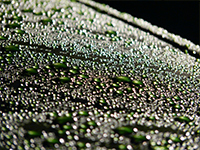 Above is how the water should behave on a waxed car, with the surface too smooth to stick to it should run off easily (sheeting) or form beads. Run-off and beading are signs of a well-protected finish, the beading above shows that the wax layer is doing its job and protecting the paint from the elements. How do I protect my paintwork? We'll start with the quick fixes and move onto the professional tips and tricks. Simply wipe on and wipe off, with no curing time you can have upped your protection in minutes! Dodo Juice's Red Mist Tropical works fine on its own if you don't have time for a proper wax, or it can be added to an existing finish adding shine, slickness and protection. Slower drying, and with milder solvents than the traditional 'Red Mist' this Spray Sealant gives ample time to polish it in lessening the risk of smearing. Washing a car with an all-in-oneIn a hurry, Dodo Juice Need For Speed cleans and polishes your car, leaving behind a layer of protective carnauba wax. All-in-One products contain cleaning agents which help to restore oxidised or dull paint, polishing agents which smooth over damage such as swirl marks, and leave a protective wax layer for shine and defence against the elements. This can be layered with a soft wax or spray sealant later if you would like more gloss and increased protection. A range of synthetic waxes and sealants have been developed to allow you to easily protect your car's paintwork. These tend to give a very reflective finish, although less beading and sheeting than carnauba wax. There are many additives and additional products which can speed up the drying time, extend the durability of, and increase the gloss of synthetic waxes. Carnauba wax is a naturally occurring wax, originating in Brazil. It is one of the hardest naturally occurring waxes, and has one of the highest melting points. It polishes to a brilliant shine, and has been used for many years as a polish. In its raw form, carnauba wax is slightly yellow, which is noticeable if multiple wax layers are built up. On a light coloured car, a degree of yellowing could be seen, and on metallic paintwork the shimmer will be muted. Carnauba wax is not quite as durable as its synthetic counterparts, and you may find that you need to reapply your wax more often in the summer months as it can evaporate in direct sunlight. Soft waxes are easier to apply than hard waxes, as the carnauba wax is mixed with other ingredients to make application easier. The Dodo Juice range includes editions designed specifically for lighter cars, and darker coloured cars, offering exceptional shine and texture. Hard waxes typically contain more carnauba wax than their softer counterparts, which means that you have a higher quality wax, but that it takes a bit more effort to work it in. Pro-waxes will sometimes include sealing agents to offer extra protection and shine. Waxing should be completed in the shade, to give the best possible conditions for the wax hazing and the final finish being smear free. Synthetic waxes don't require shade, but it's nicer to work out of the direct sunlight if you're going to be burning some elbow grease. Always apply wax to a clean paint finish, ideally after washing. If your paintwork still feels gritty then it might be best to go over it with some clay to remove the dust and debris. Wax can be applied by hand, or using a polishing machine. Apply wax to an applicator or pad or for that extra touch you can massage into your palms and apply by hand and work it into one section at a time. It's best to make these sections small and logical, for example a door panel, and to work from the top down. Avoid getting wax on plastic trims and badges as it leaves white marks. These can be removed with trim cleaners, but it's easier to avoid where possible. When the wax appears hazy, then it's time to take it off. 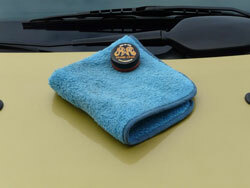 Use a new pad if you are using a polishing machine, or get a clean microfibre towel and gently buff off the wax. The car should be left with a deep shine and the paint surface should feel super smooth. Finally, clean off any wax from plastic trims, seals etc.